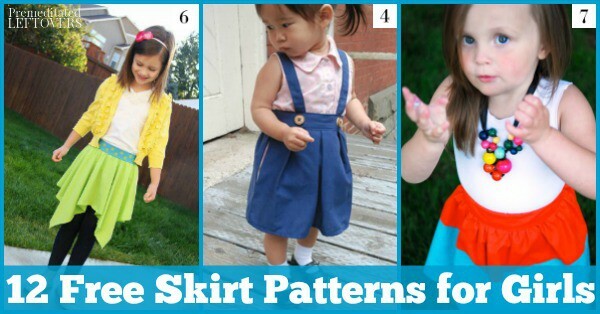 Make cute, custom skirts for the little girl in your life with these free skirt patterns for girls. When I was little, I was so excited to start the new school year or even get out for the summer. One of the reasons was, my mom used to make a lot of my clothes and she especially loved making dresses and skirts. In fact, she made my 8th-grade graduation dress. It was blue and silky and I loved it so much because it was one of a kind and no other girls in my class had a dress like that. There is something so special about getting hand-made clothes. It means more than any store-bought garment ever cold. You can feel the love and care that went into it. Plus, it's fun to see your patterns and designs take on a life and memory of their own. If you have a special girl in your life you are hoping to make memories for, here are 10 free skirt patterns for girls to get you started. 1. If you have leftover fabric from other projects, why not make this adorable Patchwork Skirt from Create Kids Couture? 2. For another great way to use up fabric scraps, try making this sweet and fun Sew Ready To Play Backgammon Skirt by I'm Feelin' Crafty. 3. I absolutely love this idea for little girls. It is a Ruffle Skirt and Leggings Combo that is perfect for little girls that like to stay active and moms that want to help keep them modest. Check out The Stitching Scientist for this very cute pattern! 4. Why not go classically adorable with this Suspender Skirt by You & Mie? It looks so cute on the younger set and is so timeless! 5. For a simple skirt that looks adorable on little ones and great on pre-teens, why not try this Phus Phus Skirt from WIDI? It even has a tutorial video included! 6. Another great skirt for girls of any age from toddler to teen is this super easy Square Circle Skirt from Make it and Love it. It only takes 20 minutes to make, so it is perfect for a quick project. 7. Shwin & Shwin has a really great skirt for kids who tend to get messy. This Reversible Block Print skirt is great for those days when you get dirty at a play date but still, have places to go after and it's easy! 8. What little girl wouldn't absolutely delight in having a Sweet Little matching skirt with their doll? Make one with this pattern from Avery Lane Designs. 9. 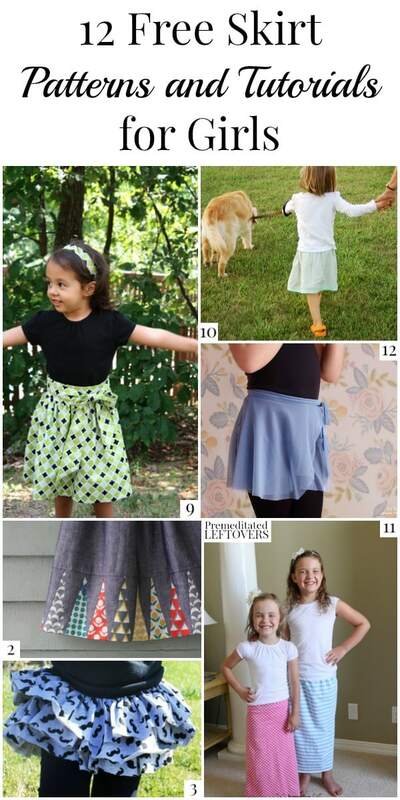 For a fun summer skirt, try making this Toddler Tie Skirt from Sew Like My Mom. It is an easy pattern to follow and seems to fit an intermediate skill level but is appropriate for everything from casual get-togethers to church. 10. The Lazy Days Skirt from Oliver + S is easy and great for doing when you have very little time. The creator of this skirt pattern says it's comfortable and easy to customize. 11. Maxi Skirts are popular right now (and super comfortable). The Crafting Chicks have a great tutorial for a Girls Knit Maxi Skirt that is sure to become a favorite summer skirt! 12. This Easy Ballet Wrap Skirt Tutorial from Make It Love It is perfect for the ballerina in your life and is appropriate for girls of all ages.